The folks of Western Michigan know how to do their research, and this year, many are trying to find out which modern hybrid car offers the best fuel economy and the most overall value. Reviews for the 2017 Toyota Camry Hybrid—on sites like Edmunds.com—have been mostly positive, but at the end of the day, this Toyota simply isn’t the best available option! In terms of fuel economy, the Camry Hybrid doesn’t even come close to matching the potential offered by the 2017 Honda Accord Hybrid. Like all of Honda’s hybrid cars, the Accord Hybrid is undoubtedly a leader in its class. There’s no reason to choose a hybrid car that can’t offer the gas mileage you desire. Although the Camry Hybrid is far from inefficient, it still only gets about 42 mpg in the city and 38 mpg on the highway. EPA estimates like these would make the Camry Hybrid a strong competitor against cheaper gasoline-powered automobiles, but against a challenger like the Honda Accord Hybrid, the former ends up looking rather lackluster. In the Accord Hybrid, drivers will be able to enjoy incredible mileage ratings of up to an EPA-estimated 49 mpg city and 47 mpg highway. * You’re sure to notice a difference this significant nearly every time you get behind the wheel! It’s common for drivers to assume that the more efficient vehicle is usually the less powerful one, but in this case, that assumption is incorrect! The Honda Accord Hybrid generates a total system horsepower of 212, while the Toytota Camry only manages about 200 hp. 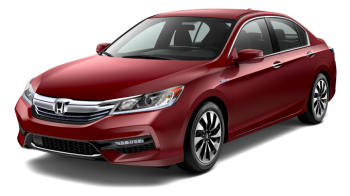 Although the Camry Hybrid does indeed have a lower MSRP than the Accord Hybrid, those who stick with Honda will quickly make up the difference with the money they’ll save on fuel! Take the Honda Accord Hybrid for a Test Drive! When it comes to fuel economy, the 2017 Toyota Camry Hybrid just can’t compete with the 2017 Honda Accord Hybrid, and our current offers and financing options can make buying your new Accord Hybrid even more satisfying! Find out if the Accord Hybrid is a good fit for you by taking it for a test drive at your local West Michigan Honda Dealer! Start a conversation with us today!